Recently, LMP’s Dr. Danny Ghazarian, one of our dermatopathologists spent some time at the Kuwait Cancer Control Centre working with pathology residents. 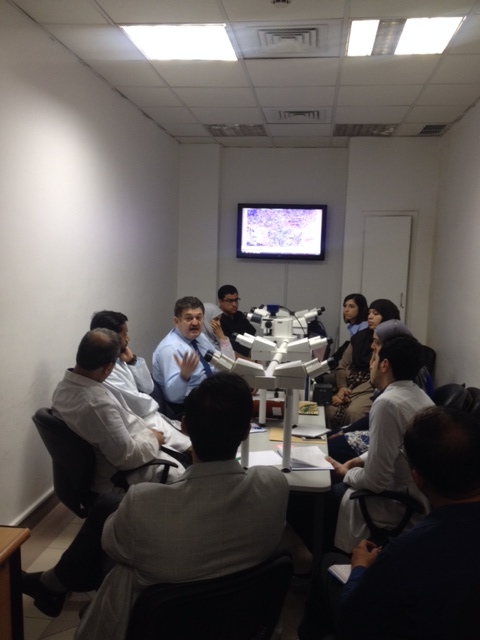 Take a look at a recent picture of Dr. Ghazarian teaching on a multihead microscope with monitor pathology residents and few pathology and dermatology staff. He and the team were discussing cases related to inflammatory skin diseases and skin tumors, both benign and malignant.